Published on January 24, 2017 in Daily Dirt, Events and National. Closed Tags: Case, Cat, Caterpillar, concrete, construction, construction industry, contractors, equipment, heavy equipment, pavement, roads, safety, transportation, trucks, WOC, World of Concrete. World of Concrete 2017 provided exhibitors with a hugely successful platform to start the year off strong, packing the show floor with qualified industry-related attendees, ready to make purchasing decisions on the latest equipment, products, and technologies available. Many exhibitors commented WOC 2017 was one of the best shows in recent memory, resulting in a 73% rebook on booth space for WOC 2018. This international event for the concrete and masonry industries, and THE first annual event of the year, drew 50,770 registered professionals and featured more than 1,455 companies exhibiting across more than 681,196 net square feet of space. Also presented was the Weatherton Scholarship, providing funds to help the next generation of concrete professionals attending the CIM (Concrete Industry Management) Program. Dan Regad, from New Jersey Science & Technology University, was the recipient of the $2,500 scholarship. In addition, CIM held its annual unreserved silent and live auctions at World of Concrete. The silent and live auctions raised an initial tally of approximately $875,000. More information on the CIM Program can be found at www.concretedegree.com. WOC 2018: January 23-26; Seminars 22-26 at the Las Vegas Convention Center. 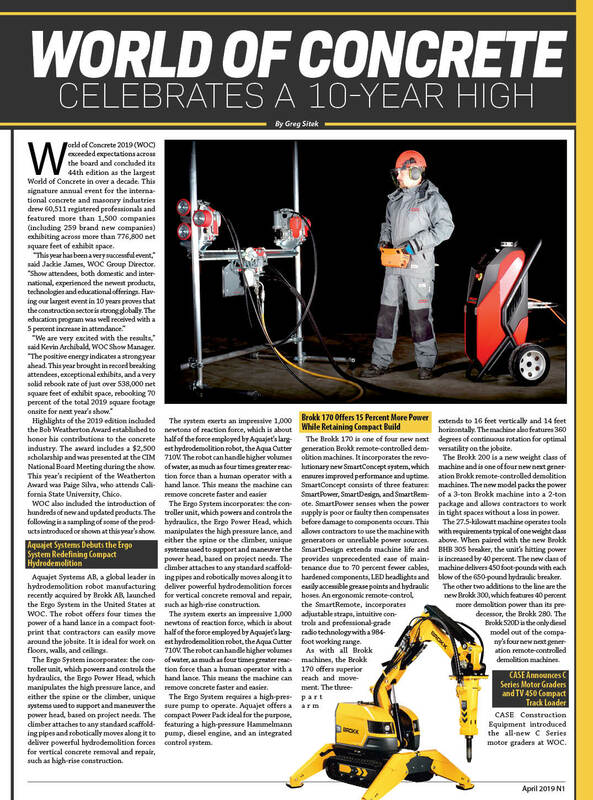 Published on February 10, 2015 in Daily Dirt, Events, Industry Activities and National. Closed Tags: Bobcat, bridges, Case, Cat, Caterpillar, concrete, construction, construction industry, contractors, Doosan, economy, Enerpac, equipment, excavators, heavy equipment, infrastructure, safety, Terex, transportation, trucks, Volvo, World of Concrete. 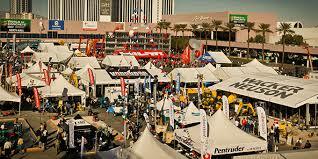 Celebrating 41 years of industry excellence, World of Concrete 2015 exceeded expectations across the board. The signature event for the concrete industry drew 55,779 registered professionals, up from just over 48,000 in 2014, and featured more than 1,459 companies exhibiting across more than 675,000 net square feet of space, an increase of more than 100,000 net square feet from 2014 . This was the largest World of Concrete in six years, and the energy & excitement from both attendees and exhibitors was palpable throughout the week at the Las Vegas Convention Center. 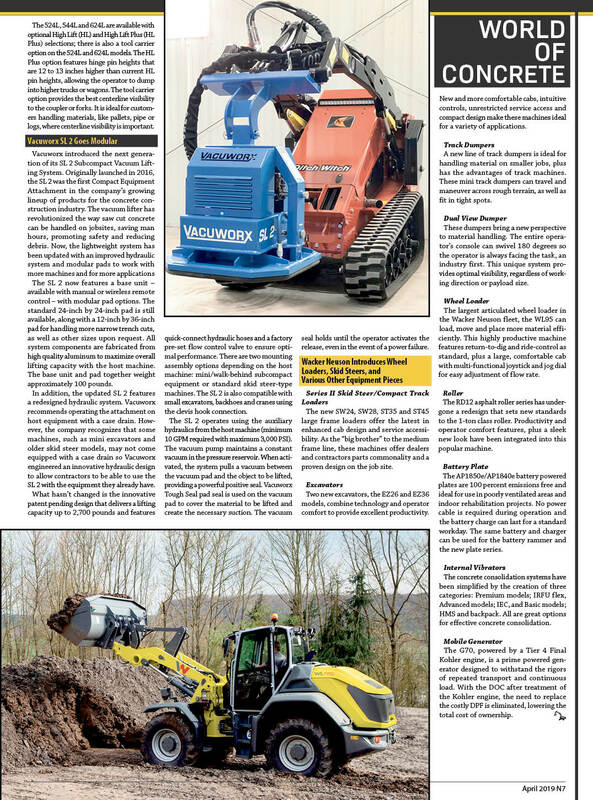 “The excitement and energy we saw at the World of Concrete this year was like no other. We are very pleased with the results of the show in all categories from the increase in the number of exhibitors (up 200 companies) to the increase in attendees (up 15%) to the increase in the number of seminars taken (up 23%). These increases show not only the value that World of Concrete brings to the concrete and masonry industries but also shows that the industry is getting stronger and poised for much success in 2015,” said Tom Cindric, Vice President, Informa Exhibitions U.S., Construction & Real Estate. “With the industry ramping up again education became a key asset at WOC this year. Attendees took more classes than they have in the last six years sharpening their skills for what’s to come. 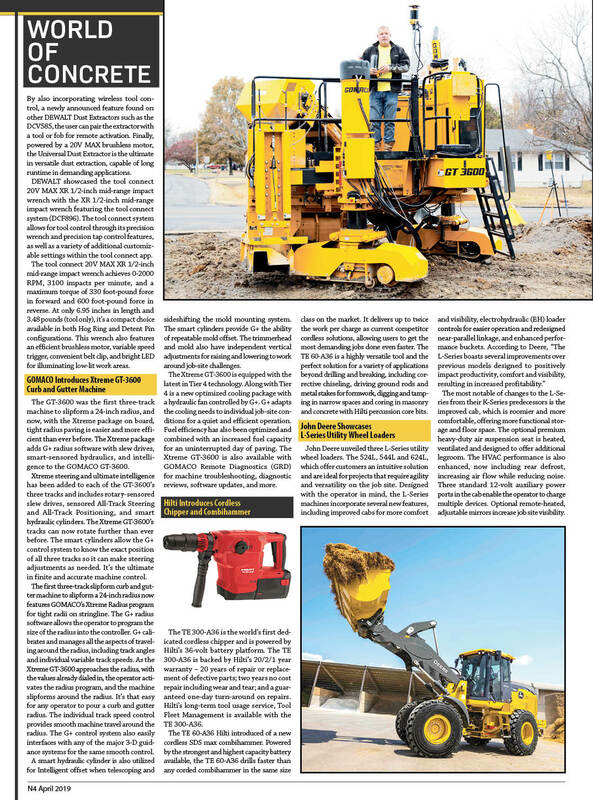 In addition, international attendees made a big impact scouring the show for new equipment, tools, and technology to make their operations more efficient and profitable,” said Jackie James, Show Director, World of Concrete. Highlights of the 2015 edition included the opening ceremony awarding the World of Concrete Legacy Award to recipient Ed Sauter, Executive Director, Tilt-Up Concrete Association, & Executive Director, Concrete Foundations Association, along with the Weatherton Scholarship, providing funds to help the next generation of concrete professionals attending the CIM (Concrete Industry Management) Program. In addition, CIM held its annual unreserved silent and live auctions at World of Concrete. The silent and live auctions raised an initial tally of approximately $800,000. More information on the CIM Program can be found at www.concretedegree.com. For the fourth year, World of Concrete 2015 recognized the accomplishments of crews in the commercial construction/masonry industry with the CREWS THAT ROCK competition, sponsored by BASF. Crew members were honored for their teamwork and contributions to the industry and their communities. Projects were submitted in one of two categories, Community Service/Not-for-Profit and Commercial/For-Profit. With 25 total finalists, including 19 in the Commercial category and six in the Community Service category, the contest resulted in thousands of online votes and tremendous interest through social networks. Langston Concrete Inc. received the award in the Commercial/For-Profit category for the Royal Gorge Bridge and Park and the International Union of Bricklayers and Allied Craftworkers’ (BAC) La Grange Park’s Veterans Memorial received the award for the Community Service/Not-For-Profit category. The two Grand Prize winners were honored at WOC 2015 during the Crews That Rock reception. BASF and TV personalities Dean & Derek presented awards and swag bags for the winning crews. Details on the winners can be found at www.crewsthatrock.com. World of Concrete 2016 will be held February 1-5; Seminars 2-5 at the Las Vegas Convention Center. 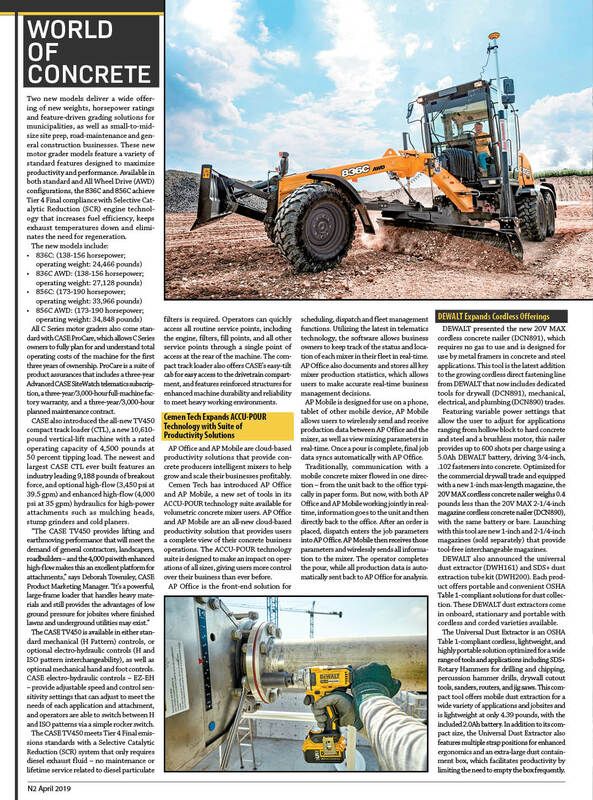 Published on January 17, 2012 in Daily Dirt, Events and Industry Activities. Closed Tags: Case, Case Triple Threat Rodeo, Habitat for Humanity, World of Concrete. Case Construction Equipment has announced that the 2012 World of Concrete show in Las Vegas – the largest international tradeshow dedicated to the commercial concrete and masonry construction industries – will serve as the backdrop for the Case North American Triple Threat Rodeo Championship. Case will host the event at its outdoor exhibit in the Gold Lot directly across from the Las Vegas Convention Center North Hall. Nearly 60 of the most talented equipment operators in the United States and Canada will compete on Jan. 24 for the grand prize combo of a new Case TR270 compact track loader and a Towmaster® trailer for the winner’s sponsoring company and a new Dodge Ram® 2500SLT truck for the winner. The total value of all prizes exceeds US$140,000. From a field of more than 1,500 participants who competed in Case Triple Threat Rodeo events across the United States and Canada this year, the winners of the 56 local rodeo events each received US$500 in cash and Case gear and qualified to compete at the championship event. Attracting more than 10,000 visitors, the local dealer events proved successful in terms of competitors, overall attendance and fundraising efforts in support of Habitat for Humanity affiliates. World of Concrete attendees are invited to visit the Case Triple Threat Rodeo course to compete in a daily “Sasquatch Challenge” compact excavator skills event, sponsored by Case and Jack Link’s Beef Jerky, to win a Case parts locker loaded with US$3,500 worth of Jack Link’s Beef Jerky products. The famous Jack Link’s “Sasquatch” advertising character will be at each day’s event – Jan. 24 through 26 from 9:30 a.m. to 5 p.m., and Jan. 27 from 9:30 a.m. to 1 p.m.
Marringa said Case also will welcome any licensed equipment operator attending the World of Concrete show to attempt completing the entire Triple Threat Rodeo course, which will be open on Jan. 25 and 26 from 9:30 a.m. to 5:00 p.m., and on Jan 27 from 9:30 a.m. to 1:00 p.m.
Case will make a corporate contribution of US$5,000 to Habitat for Humanity Las Vegas at the championship event, one year after kicking off the Triple Threat Rodeo program with an identical US$5,000 donation. In addition, each participating Case dealership made a donation to its local Habitat affiliate, which brings the total raised during this program for Habitat affiliates to US$51,726. Combined with funds raised through earlier equipment rodeos and other company and dealer events, Case and its dealers have contributed an aggregate total of approximately US$250,000 to local Habitat for Humanity affiliates. Published on December 19, 2011 in Daily Dirt, Events, Industry Activities and Uncategorized. Closed Tags: concrete, construction, construction industry, contractors, equipment, heavy equipment, WOC, World of Concrete. World of Concrete, in partnership with Maryland-based Core-Apps, today released a new mobile app available for iPhone, Android and Blackberry. The new offering gives attendees and exhibitors access to a fully integrated trade show solution that streamlines real-time information including alerts, interactive floor plan and networking tools. iPhone (plus, iPod Touch & iPad) and Android users: visit your App Store or Android Market on your phone and search for WOC 2012. Blackberry and all other web browser-enabled phone users: point your mobile browser to http://m.core-apps.com/woc2012 to be directed to download the proper version of the app for your particular device, or on some phones, bookmark this page for future reference.